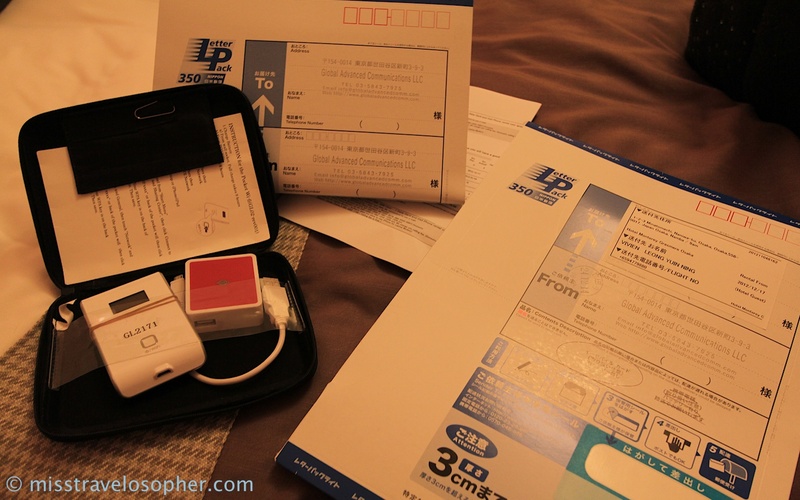 There are many ways to get your smart phone connected when you are traveling around in Japan. Some hotels provide free wifi, charge for a fee, or provide computer terminals at the lobby or business lounge area. From my past experience, quite often wifi is not available at the ryokan or minshuku. If you are depending on the wifi at your accommodation to plan your trip, please make sure that you check before booking your stay. As I relied on my smart phone heavily to plan my trip on the go, my options were either renting a phone, sim card, or mobile wifi device. After some deliberation, I opted to rent a mobile wifi device as it will allow me to connect devices other than my phone to the internet as well. After searching around, I found this device from Global Advanced Communications. I chose the 75Mbps model as it promised 9hrs of battery life (the 42Mbps model will last only 4-5hrs). This device connects to the e-mobile network. It was awesome and I loved it! I could check the train schedules, google maps, food recommendations and get connected to social media on the go! The connection was fast and I could get connected even when I was traveling on the city subways. However, it did lose connection when I was traveling up the mountains. I can’t remember it lasting for 9hrs, but it did last long enough through the day. The price was affordable too and it gets cheaper if you rent it for longer durations. In my case, I paid 11,200yen for 21 days’ rental. And did I mention this? This pocket wifi allows up to 5 devices to connect simultaneously, so you can be assured that your travel partners will be able to enjoy the internet connectivity as well! It was easy to bring it around in the bag as it was very light (< 90g) and handy [56(W)×97(H)×18.0(D)mm]. Ordering was simple and involves just some mouse clicks to confirm the rental details. You can specify when and where you wish the device to be delivered (delivery is free of charge). If you wish to pick it up at the airport (only during office hours), you can arrange for it as well. Returning the device was so convenient too. In the package, you will be given a return envelope to drop off the device at any post box convenient for you when you are done with the rental. I dropped mine off at the Kansai Airport before flying off. I suggest to book these way in advance of your trip. I tried booking from Global Advanced a few weeks ahead and still got an email back that said they were all out for my travel period. I ended up renting one from http://www.rentafonejapan.com which actually came out a bit cheaper.